The Mythopoeic Society uses the PayPal Shopping Cart to process orders. Use the "Add to Cart" links through the site and the "Proceed to Checkout" button from within the cart to complete the transaction through PayPal. You do not need a PayPal account. Please note: when you buy electronic issues of Mythlore, etc., select the "return to Mythopoeic Society website" option after completing your transaction and PayPal will redirect you to the page from which you may download the PDF. 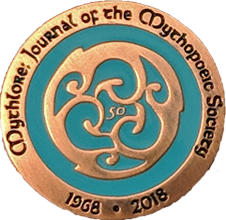 The NEW 50th Anniversary of MYTHLORE Lapel Pin features the society's triskelion logo in a 1" copper metal with turquoise cloisonné (hard enamel) color fill and deluxe clutch. $7.00 plus shipping. 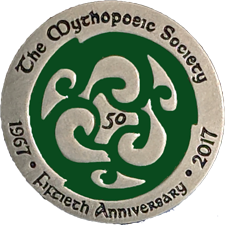 The Mythopoeic Society 50th Anniversary Lapel Pin, new in 2017, features the society's triskelion logo in a 1" pewter metal with green cloisonné (hard enamel) color fill and deluxe clutch. $7.00 plus shipping. The Mythopoeic Society Lapel Pin features the society's triskelion logo in a 5/8" die struck silver tone metal with green cloisonné (hard enamel) color fill and deluxe clutch. $5.00 plus shipping. The Mythopoeic Society Emblem Buttons feature the triskelion design in white on a blue background; 1¼" in diameter. $1.00 for one; $2.00 for three plus shipping. 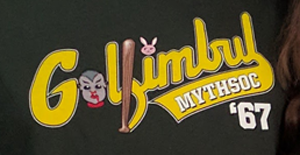 In honor of the Mythopoeic Society's 50th Anniversary and the ever-popular late night sport Golfimbul, we now offer official Golfimbul t-shirts. Sizes small through extra-large are $18.00 plus shipping; double extra-large size is $20.00 plus shipping. Larger images and more information. 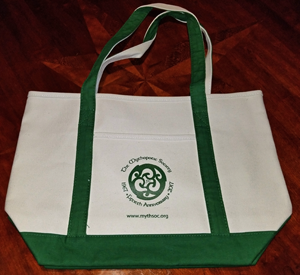 Continuing the celebration of the Society's 50th Anniversary, we offer this large canvas tote bag with triskelion logo and pocket on one side. Especially helpful in California and other locations which force stores to charge customers for paper or plastic bags, now you can help save the environment and support the Mythopoeic Society at the same time! $25.00 plus shipping. 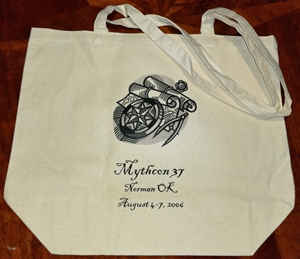 We also have tote bags from Mythcon 37 for sale at $20.00 plus shipping. In addition, we have Mythcon 37 T-Shirts in medium and large sizes, buttons, and notebooks. Please click here to view and purchase. This Celtic Stationery has been designed by Patrick Wynne; from art originally printed in Mythlore #35. Motifs from Tolkien, Lewis & Williams. 8½" x 11" on ivory parchment paper. Includes 16 printed sheets, 12 blank sheets, 16 envelopes. $8.00 plus shipping. These Postcards, displaying the Mythopoeic Society Coat of Arms, have been designed by George Barr. Set of 10 for $3.00 plus shipping. 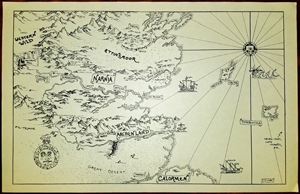 This Narnia Map, created by Tim Kirk, originally appeared in Mythlore #7. Black and white, 11" x 16". $5.00 plus shipping. 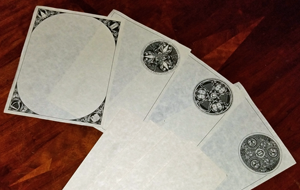 The Mythlore Art Portfolio includes five pieces printed on quality paper, 9"x12", suitable for framing. Art by Sarah Beach, Paula DiSante, Nancy-Lou Patterson, Patrick Wynne. $15.00 plus shipping. 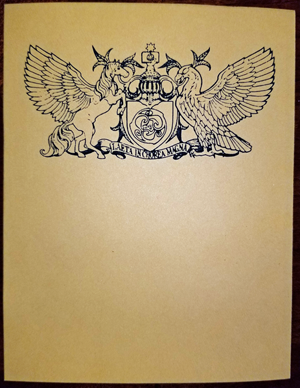 Papers delivered at the first three Mythopoeic Conferences (1970-1972), as well as the pre-cursor Narnian conference (1969), were published in conference proceedings and available for purchase (beginning with Mythcon 4, papers presented at conferences have been considered for our scholarly journal, Mythlore.) Program books from various Mythopoeic Conferences are also available, while supply lasts; please order from our Proceedings & Program Books page. Mythlore is a scholarly, peer-reviewed journal published by the Mythopoeic Society that focuses on the works of J.R.R. Tolkien, C.S. Lewis, Charles Williams, and the genres of myth and fantasy. Visit the Mythlore Back Issues page to view a complete list of all issues of Mythlore. To subscribe to receive future issues, please visit the Mythlore Subscriptions page. An index for Mythlore, including issue 1-102, is available for free through the Mythopoeic Press and may be downloaded as a PDF here. The Mythic Circle is a small literary magazine published annually by the Mythopoeic Society which celebrates the work of J.R.R. Tolkien, C.S. Lewis, and Charles Williams. Visit The Mythic Circle Back Issues page to view a complete of all issues of Mythic Circle. To pre-order the next issue, please visit The Mythic Circle page. Mythprint is the quarterly bulletin of the Mythopoeic Society. It publishes book reviews, short articles, event information, and other notices of interest to Society members. Visit the Mythprint Back Issues page to view a complete of all issues of Mythprint. To subscribe to receive future issues, visit the Mythprint Subscriptions page. Parma Eldalamberon ("The Book of Elven Tongues") is a journal of linguistic studies of fantasy literature, especially of the Elvish languages and nomenclature in the works of J.R.R. Tolkien. Photocopies of the first five issues are available here. The Elvish Linguistic Fellowship, a special interest group of the Mythopoeic Society, now publishes this journal. For information about the availability of more recent issues (6-22), visit their Parma Eldalamberon page. Vinyar Tengwar is the not-for-profit refereed journal devoted to the scholarly study of the invented languages of J.R.R. Tolkien, also published by the Elvish Linguistic Fellowship. For information on availability and prices, visit their Vinyar Tengwar page.